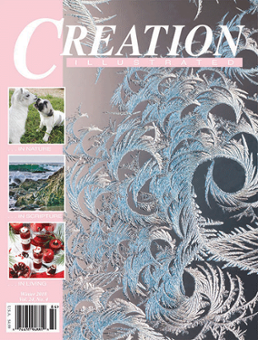 During one of the coldest years in recent memory, Creation Illustrated provided us with two of their unit studies plus access to the magazines to go with for us to review. The amusing part? One of those unit studies was The Intricacies of Snow! You would think that we folks living in southern Alberta would know pretty much everything there is to know about snow but (as we recently discovered) this is simply not true. Starting with a list of reading and educational resources including videos (there are handy links to them all as well) this unit study is packed full of everything you’ll need to cover topics from Bible Study to science and math plus a lot more. A truly complete unit study. 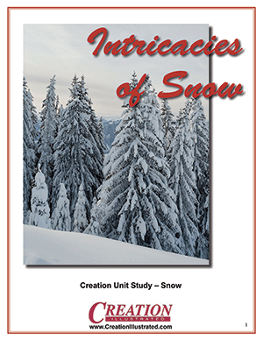 We began by reading The Intricacies of Snow in the Winter ’18 digital edition of Creation Illustrated. This article speaks to the spiritual connections between snowflakes and ourselves. There was one particular paragraph (I won’t spoil it for you) that led us to take a walk outside in the grove of trees near our home and appreciate the wonder and peace of the falling snowflakes. EJ was excited to move on to the video section (he’s 11) where he learned more about snowflakes, science, and Snowflake Bentley (we reread the book we already had about him as well.) The variety of videos are sure to keep any young person interested and curious, even those who live in the Great White North! We decided to begin with the vocabulary work in the unit and used those words for our spelling lists. It made sense since each of these words had appeared in the “Intricacy if Snow” story in the magazine so they were fresh in EJ’s mind. We also chose to spread our Bible study out and read one or two passages a day to appreciate the meaning and context of each one. Because EJ is at the young end of the age range for this unit study and being ADHD with dyslexia, we chose to do the section on Spiritual Lessons in Snow together, using the questions as discussion prompts. Doing it this way freed him up from worrying about spelling and writing his responses and he was much more involved with his responses. There are some fun art and science activities in this unit as well, including making “snow” crystals and 3D paper snowflakes (we have always done the flat ones so these were a lot of fun!) There is another activity that involves outdoor temperature taking where our abundance of snow came in handy. We didn’t manage to build much of a structure but we had fun trying and were able to see how much of an insulator snow can be. EJ was fascinated to learn about snowfall levels in different parts of the world as he worked through the geography lesson (he did find the labels on the map a bit confusing so he went to the original source online.) He found it was easier to locate the areas on Google maps. Plus this offered the added benefit of satellite images and street views that showed fairly current snow cover in some of the regions. 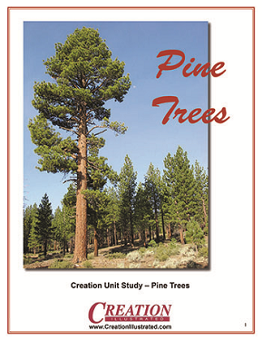 I don’t want to give away any more of the fun from this unit study but I would like to share a bit about the other one we received, The Enduring Pine Tree. This second unit study follows the same format as the Snow Unit so, again, is very complete. You begin by reading the article, The Enduring Pine Tree, in the Fall ’17 digital edition of Creation Illustrated. Again, there is a solid list of readings plus videos for this unit that provides a good base of learning. We haven’t had a chance to work on this unit a lot yet but I’m sure there will be a visit to nearby Banff National Park in our future where we will be able to see these majestic trees in the equally breathtaking Rocky Mountains. This is one of our favorite places to visit and take our lessons outdoors and these unit studies are terrific for packing up in a binder and taking along with us. 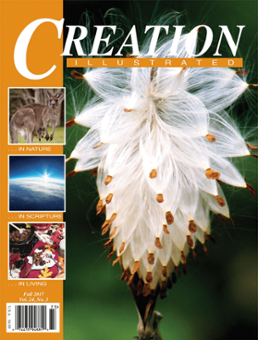 I’ve just heard that the Spring ’18 digital edition of Creation Illustrated and a new unit study on butterflies will be available soon. Here’s a sneak peak of the magazine cover for you. I don’t know about you but after this long winter, I’m certainly ready for some springtime reading and I’m positive that the Spring edition will be just as jam-packed with beautiful photographs and heartwarming stories that are both educational and uplifting for the whole family. All of this and more are available by clicking here on the Creation Illustrated website. And for those of you who have a blog, you might be interested in joining the new affiliate program, you can sign up for it on their site too. To read reviews by other members of the Review Crew, click the image below. NOTE: This post contains affiliate links. If you purchase an item from one of these links I may receive a small commission that will help me continue to write and research for this blog. This sounds so cool! Something to keep in mind when my little ones get older.